The Charlotteville Rascals Coaching team aim to organise four Rascal Racing / Go-Ride Races per year. Go-Ride races are open to everyone from 6 to 16. This includes all the Woking and Guildford Rascals as well as children from other Go-Ride Clubs. 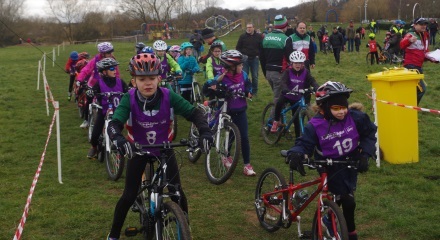 Rascal Racing / Go-Ride Races currently take place at Goldsworth Park Recreation Area, Woking. Please be aware this venue is not suitable for bicycles fitted with road tyres. Registration on Rascal Racing / Go-Ride Race day is between 9.00 and 9.20 am. Riders arriving after 9.20am will not be able to race. Riders do a single timed lap around the perimeter mountain bike track, with the fastest three riders collecting the medals. Riders negotiated their way around an obstacle course on the challenging terrain of the mountain bike inner track. The fastest and cleanest (penalty per cone hit/obstacle failed) three riders collecting the medals. Riders are split up and given a flavour of various classic race events: Devil; 4 Cross; Team Sprint. Riders are lined up on the start line of the perimeter mountain bike track with their grid position and start delay set from the Individual Time Trial. As they are released the faster riders have to dig deep to close the gap on those ahead. The aim is that all the riders converged on the last lap. First three riders home collect the medals. Racing is general all completed by 12.00 at which time the presentations and awards are given out. Remember as its racing there will always be some waiting around so please can you ensure that you have suitable clothing and plenty of layers including layers that can be easily take off/put on while waiting or racing. Plus plenty to drink and snacks to keep yourself fuelled up for the racing. Rascal Racing / Go-Ride Races are fun sessions so please encourage your parents stay and cheer on all the riders. Come along and have a go at Cycle Racing, we eagerly look forward to seeing you. If you enjoy yourself at Rascals Rascal Racing / Go-Ride Races and would like to attend the regular cycle coaching sessions you need to get you parents or guardian to email waitinglist@charlottevillerascals.org.uk Prospective riders are invited to a set of induction sessions to see if they would like to participate. Induction sessions are run after the Easter and Summer Holidays.